Home Entertainment AVRS Moves To Commence Licensing And Distribution Of Royalties. AVRS Moves To Commence Licensing And Distribution Of Royalties. Key industry players and top stakeholders of the audiovisual sector of the Nigerian entertainment industry have charged the leadership of the Audiovisual Rights Society of Nigeria (AVRS) to ensure that it provide efficient and cost effective means of not only representing the right owners but also ensuring that right users begin to pay for rights for the benefit of practitioners of the industry. The practitioners have the charge at the maiden stakeholders-users forum organized by the AVRS and held at Eko Hotel and Suites last week. At the well attended event that attracted big names in the motion picture industry, industry regulators like the Nigerian Copyright Commission (NCC), officials of banks and other financial institutions, lawyers and captains of industry, the panelist and guest who took turns to speak emphasized the need for the AVRS to set the machinery for rights collection and administration in motion especially against the backdrop of the massive transformation and continuous expansion that the audiovisual landscape has witnessed in the last two decades. They also stressed the need for the timely interrogation of what the future holds for practitioners especially with the emerging models that have come to redefine the roles of players and the value chain in the commercialization and exploitation of creative content. Earlier in his welcome address, Chairman of the AVRS Mahmood Ali-Balogun noted that while the AVRS may have recorded some progress in the areas of enlightenment, membership data analysis, capacity building for staff and management and strategic partnership building processes, the AVRS as the Chairman observed is still many steps behind, given that the CMO was licensed near five years ago and till date, the CMO is still far off licensing and distribution of royalties, which as he stressed ‘are the two fundamental purposes for which AVRS was established and approved as a CMO’. 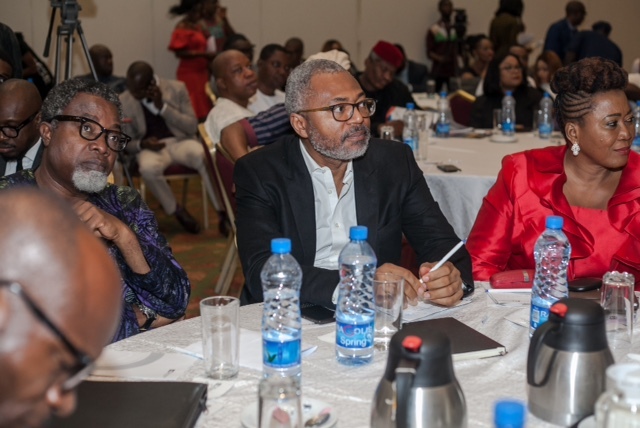 Mr. Mahmood Ali-Balogun, Emeka Mba & Nkechi Ali-Balogun. 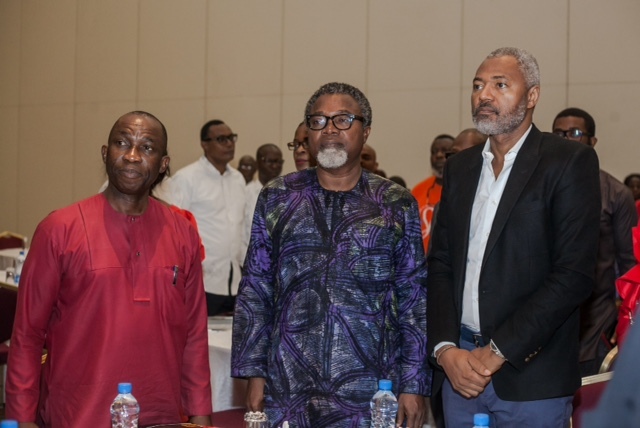 Other speakers at the event include CEO of Dragon Africa and Chairman Social Media Week Nigeria, Obi Asika, the CEO of ACC Broadcast Multimedia Limited, Dr. Don Pedro Obaseki, Sandra Oyewole, partner at Olajide Oyewole LLP and Chijioke Uwaegbute of Pricewaterhouse and Cooper. 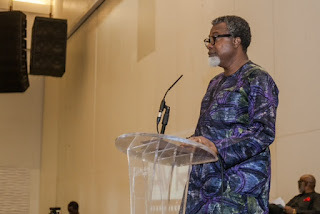 They were unequivocal in their submissions that AVRS must rise to the occasion especially if the overall intention is to empower the practitioners of the industry in the light of the rise in content consumption. Some other notable personalities and stakeholders attended the forum and they are, rep of MultiChoice Nigeria Ltd, Mr. Chris Aigbe of Fidelity Bank and President of ACAMB (Association of Corporate Affairs Managers of Banks), Chief Samuel Alabi of Eko Hotel & Suites and President of HOMAL, key artistes - Tina Mba, Fred Amata, Femi Odugbemi, Sola Sobowale, Shaffy Bello, Emeka Rollas, Zeb Ejiro, Ibinabo Fiberesima, Ralph Nwadike and other guests - Mena Ajakpovi and Obafemi Agaba, Abosede Adegboye (PwC), Tony Okoroji, Nkechi Ali-Balogun, etc.